One of the films I have been following closely and waiting patiently for its grand unveiling is Rosewater, the directing feature debut of The Daily Show host Jon Stewart. Filmed last summer in the Middle East, Rosewater is now ready for release and Stewart will be bringing the film to the Telluride and Toronto Film Festivals. Gael García Bernal stars as Iranian journalist Maziar Bahari, who was detained and tortured for 100 days after appearing on a segment of The Daily Show. We'll be catching it at Telluride and can't wait to see what Stewart has up his sleeves with this one. Solid poster for an activism drama. Take a look below. 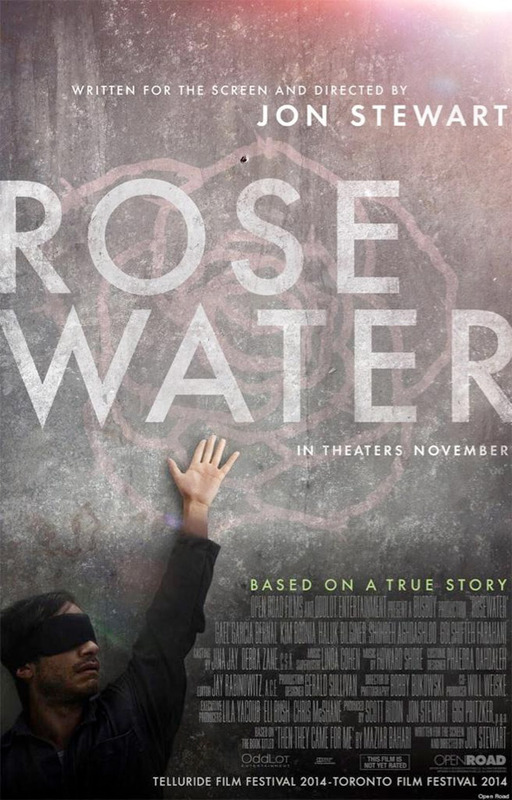 Here's the first poster art for Jon Stewart's Rosewater, pulled from Twitter. See the official trailer now. From the TIFF 2014 guide: "In 2009, Iranian Canadian journalist Maziar Bahari was covering Iran's volatile elections for Newsweek. One of the few reporters living there with access to US media, he also appeared on The Daily Show with Jon Stewart, in a taped interview with comedian Jason Jones. The interview was intended as satire, but if the Tehran authorities got the joke they didn't like it — and that bit of comedy would come back to haunt Bahari when he was rousted from his family home and thrown into prison." He was held for 100 days. Rosewater, written and directed by Jon Stewart, will premiere at Telluride & TIFF. Open Road will release the film in theaters starting November 7th this fall. Watch the first trailer here. So ready for this. I was so surprised when he took that hiatus from THE DAILY SHOW to go shoot this. Stewart is a ball of talent.